Many coaches will tell you that the most important factor in becoming a good hitter isn't necessarily being able to hit a curveball, it's having perfect timing. Being able to time your swing from the moment the ball is released is the key to making solid contact, they say. Those coaches will also tell you that the best pitching machines for getting your timing down are ones that throw with an arm, not a wheel. You know, the ones you see at most public batting cages. Contrary to popular opinion, JUGS Sports did not invent the pitching machine. The first pitching machine was invented in the late 1800's and used gun powder to propel balls. That machine caused so many accidental injuries, it wasn't commercially viable, though. 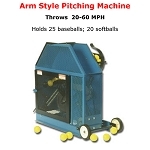 The first commercial pitching machine was an arm pitching machine and was invented in 1952 by Paul Giovagnoli. In 1976, he founded Master Pitching Machines – the same company that produces the Iron Mike line of pitching machines. While it is true that Iron Mike pitching machines cannot throw curves, they are the only pitching machines made that show the ball and release it with an arm – just like a real pitcher does. This allows the batter to get a far more realistic hitting experience. They can throw baseballs or softballs, too. Iron Mike pitching machines are certainly the first hitting machines that come to mind for people who want to open a commercial batting cage business. They have full systems that include the cage and a system to collect balls, after all. They also make machines that you can set up in your backyard and are even portable. 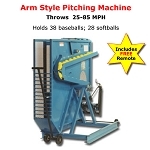 At Pitching Machine Stop, we carry Discount Iron Mike pitching machines for home use as well as some other Master Pitching Machine products like batting cages and balls that can be used for home setups. If you're looking to set up a commercial, coin operated cage system, give us a call for pricing. Unlike other websites that tell you to call to see the real end price, the prices you see here include free shipping to anywhere in the continental USA.